Rent or buy Pirates of the Caribbean: Dean Men Tell No Tales here. WHAT'S PIRATES OF THE CARIBBEAN: DEAD MEN TELL NO TALES ABOUT? There's bad news and there's good news. The bad: with this last Pirates movie it's apparent that Disney will never recapture the “lighting in a bottle” charm of the first film. 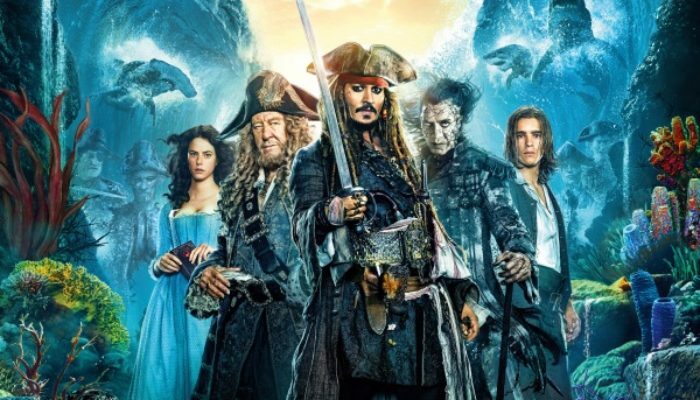 The good: Dead Men Tell No Tales somehow gives meaning to the thrice-aimless sequels, threading narrative strands from the previous four movies together into something we've not had since Part One: an emotionally-satisfying ending. Though deeply flawed, this is a better movie than the Rotten Tomatoes score would have you believe. It's true, Johnny Depp plays Captain Jack as a bit more of a washed-up drunkard than he has in the past. In the first film one gets the sense that he's crafty and rather ingeniously playing the fool; here he's just a fool with alternating bad and good luck. He still has some great moments, but he's no longer the most interesting aspect of his own Pirates movie. That honor here belongs to Javier Bardem's chilling villain, Captain Salazar. He's a marvel of visual effects and excellent acting, and he rivets the attention every moment that he's onscreen. Geoffrey Rush's Barbosa gets more meat to chew here; he's a great actor and he makes the most of it. Sadly, newcomers Brenton Thwaites and Kaya Scoledario fail to leave much of an impression. They're fine as individual characters, but as potential love interests they've little chemistry, paling compared to the genuine spark Orlando Bloom and Kiera Knightley had as William and Elizabeth. There's too much expository dialogue, too many plot conveniences, and too many flat jokes, but there's also some inspired set pieces, wonderful moments of verbal and physical comedy, and smart retconning of previous films' mistakes to give the whole series the feel of an intentional five-part epic. For all its flaws, it's a gratifying finale. Pirates of the Caribbean: Dead Men Tell No Tales is rated PG-13. It's bloodier and arguably scarier than previous entries, with menacing ghosts slaying numerous pirates and sailors, impaling them with swords onscreen. Captain Jack is frequently drunk. There's more innuendo here than in previous films, with references to pirate association with prostitutes, Jack's dalliance with a married woman, and “honeymooning in the barn” that will likely go over children's heads. A woman wears a cleavage-revealing dress for most of the film. Do what is necessary to protect your family. Even people who've done terrible things can find some redemption. Revenge leads to ruin. For another great Disney adventure with pirates galore, check out Swiss Family Robinson, which you can rent or buy here.